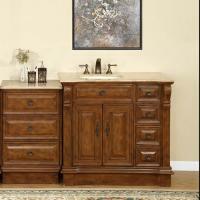 This 55 inch single bathroom vanity has an offset sink to either the left or right which gives you more counter space. We call this a modular unit with an extra set of drawers for storage. 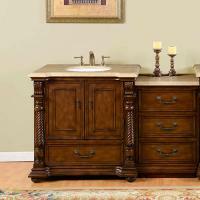 It is a separate piece so you can put it on either side of the vanity or on a different wall altogether. Lots of choices with this one where you have your choice of counter top and which side you want the sink on. 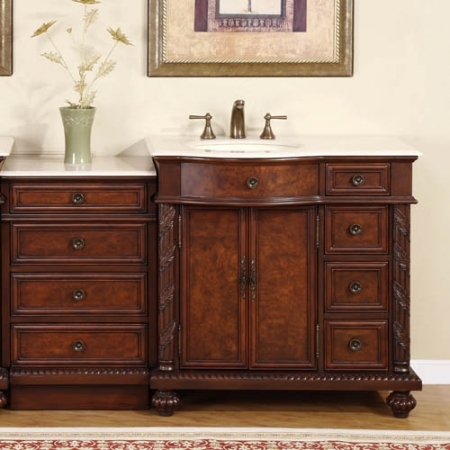 This single vanity comes with 2 doors and 8 drawers for an abundance of storage. Antique brass hardware sets off the brown burl finish. 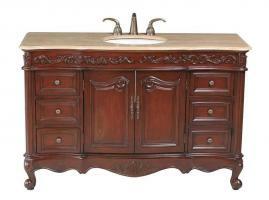 The very intricate detail along the sides and bottom of the vanity will make it a great centerpiece for your bathroom. Additional Sizes: Also available in 36 Inch Single Sink Bath Vanity, 55 Inch Single Sink Bath Vanity, 90 Inch Double Sink Bath Vanity. 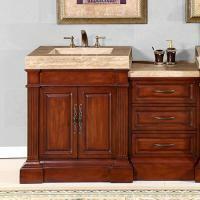 Counter Top: This vanity comes with a choice of countertop. Granite is a hard non-porous surface, which makes it an ideal material for countertops. Granite resists heat, scratches and stains, and protects against mold and mildew. It’s recommended that you seal granite every 6 - 12 months. Marble is a porous stone, and offers a unique look with its natural veining. Marble requires more maintenance than other natural stones, but can last a lifetime if taken care of properly. Marble can be damaged by acidic foods and cleaners, and is more vulnerable to scratches and etching (water marks) if not dried routinely. It is recommended that you seal Marble every 3 - 6 months. Fully Assembled: The base cabinet is ready for installation right out of the box. The countertop and sink will be attached to the base cabinet. 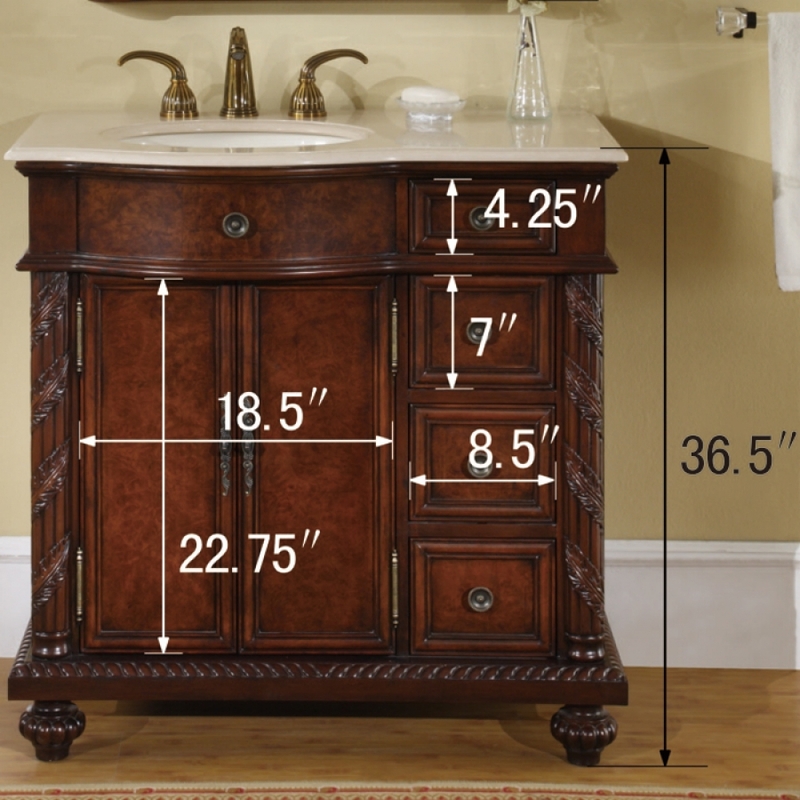 Some furniture style vanities are shipped without the feet attached, which require installation by simply screwing in, all parts included. 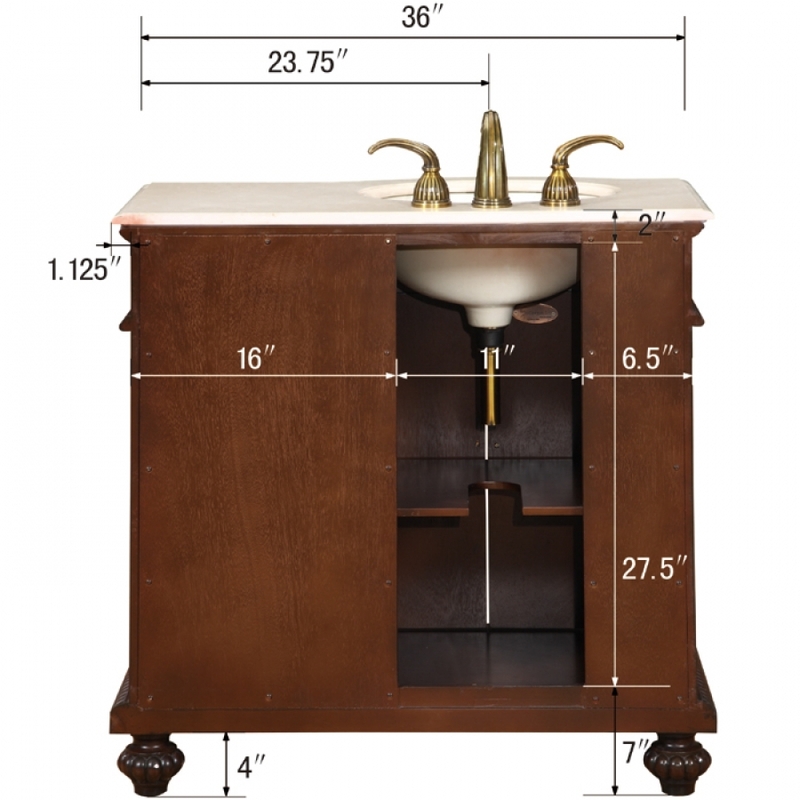 If it’s a modular vanity, the vanity may be delivered in more than one piece, which is noted in the table above. These cabinets are designed to be set next to each other with no additional installation. If additional accessories are included, such as faucet, mirrors, etc., these accessories will require installation. Includes an open space for plumbing accessibility. I was extremely impressed with the packaging of the vanities that were delivered to us. It would have taken a major accident for the vanities to be delivered damaged. Once unpacked, my first thought was that this is better than the online pictures.The quality is excellent and construction was solid. The only downside is that know we have to to decide if we should upgrade the other bathroom products we will be installing in order to be in agreement with the vanities. Customer service was great, as is the quality of the vanity ordered. Only downside was delay because the vanities we chose were out of stock. We have appreciated the communication line and helpful voices on the phone and follow-up. We are doing another bathroom soon and will be ordering from this company.